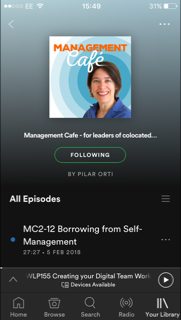 In this episode, Pilar and Lisette talk about what needs to change in our way of working and how our mindset would need to change. 00:30 Pilar introduces the episode and asks for your input, as we still need to record Part 2 on this topic. 07:50 Pilar reads her virtual rhyme Tool Overload. 09:50mins Lisette is currently running her Work Together Anywhere workshop, so they talk about the irony that most people seem to prefer to take training about online work, in person. 12:15mins Playing with space during learning and meeting, both on and offline. Changing the dynamics by changing the space and tool. 16:25mins We talk about Virtual Team Talk, what's going on there? Do groups have to be private to encourage meaningful conversation? 21:40mins You must read Team of Teams! What will the new status symbols be in the virtual workplace? Have you watched The Good Wife? Can instant communication suggest more direct control? Look out for episode 53, on Workshift.